India has over 50 million registered Small and Medium Enterprises (SMEs) with a total debt demand of over USD 520 billion, and the sector, together with various segments that have been under-served so far, offers a huge scope to the country's Non Banking Financial Companies (NBFCs) for growth, said Saurabh Jhalaria - CEO SME Business, InCred, in an exclusive interview with SME Times. Please tell us about InCred? When and how you started this venture? Saurabh Jhalaria: InCred was founded in the year 2016 by Bhupinder Singh with the vision of furthering financial inclusion in India. Prior to InCred, Bhupinder used to head the Investment Banking division for Asia-Pacific at Deutsche Bank. InCred uses technology and data-science to make borrowing quick and easy with a sharp focus on serving the needs of customers and on delivering a superior customer experience. We want to be the key partner for all financial requirements of an Indian family and it is with this objective that we are giving loans in 4 categories - SME loans, affordable housing loans, consumer loans and education loans. We have launched our products and services in the market in Jan 2017 and have received a very positive response from all stakeholders. We've disbursed more than INR 400 crore in loans to over 2500 customers in just 6 months of operations. We have also built a strong team of over 400 employees spread across 12 cities in India. We have recently signed up the former Captain of Indian Cricket Team, Rahul Dravid, as our Brand Ambassador. Of late a number of tech-savvy online based NBFCs have emerged? What are your views on this trend? Saurabh Jhalaria: While a lot of tech-savvy online based NBFCs have emerged, the market is growing fast and carries the potential to absorb more players willing to address needs of the various segments that have been under-served thus far. We have noticed that in India, SMEs face serious challenges in raising finance from banks and financial institutions. In fact, in India, there are over 50 million registered SMEs with a total debt demand of over USD 520 billion. Banks, NBFCs, and other players currently serve only around 20% of the market. There is still a huge market including healthy businesses that require funding but choose to use informal sources of finance. This is the reason why many businesses arenât able to scale up or survive. Although several fintech players and NBFCs are focusing on this credit gap now, the borrowing process is also still largely paper-driven, time-consuming and poor in customer experience. InCred combines its digital and offline capabilities to deliver a best-in-class experience for its customers. In which areas traditional lenders are lagging and in which NBFCs outsmart them? Saurabh Jhalaria: There is tremendous potential for fintech companies that are providing business loans to SMEs and personal loans to consumers. These segments contain large sections of "new to credit" customers or those who have traditionally been considered non-creditworthy due to lack of data availability. Thus, these segments have been largely ignored by traditional lenders. Additionally traditional lenders tend to have strong focus on collateral, rely on historical financial statements and have lending policies unable to cater to this segment. NBFCs like us fill in those exact gaps. We've developed bespoke risk scorecards for these segments of customers and use algorithmic credit decision-making to assess credit worthiness and give loans. Our other area of focus is to improve the turn-around time of delivering the loans to customers thereby making it a much better experience overall. You provide SME Business Loans, what type of response you are getting from this segment? 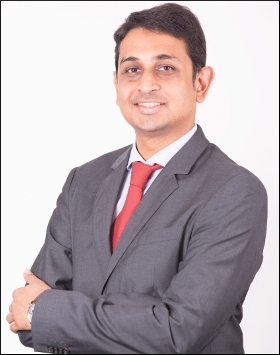 Saurabh Jhalaria: We strongly believe in bringing a human approach to lending and delivery of a superior and seamless customer experience across all touch points. Thus, we are offering a wide suite of loan products that are flexible and can be tailor-made to suit the unique requirements and business cycles of each borrower. We offer short term working capital loans, invoice financing (45-60 days),medium term unsecured loans (24-36 months) and long term secured term loans (up to 10 years) to SMEs. We also give infrastructure loans to educational institutions in India. The initial response to our products has been fantastic in all the cities and segments that we have started operations in. We are now expanding both our product range and geographic footprint in this regard to fulfill the credit demand of a segment that has been under served and under penetrated by traditional lenders. How would you advise an SME to prepare itself for loans from banks or from a NBFC like yours? Saurabh Jhalaria: There are several things that an SME can do to prepare itself for loans from financial institutions. To begin with, small businesses must start maintaining their book of accounts properly in order for lenders to assess the financial stability of the business. Moreover, as the credit worthiness of a small business is crucial and the wealth of the business is closely associated with the owner's personal credit status, it becomes important for the promoters, partners or directors to establish and maintain personal credit score. Lastly, I would advise SMEs to carefully evaluate various financing options available in the market, increase their financial literacy about various loan products and then select the loan that best meets their business requirements. Do you think this NBFC revolution will be able to make a big difference in terms of SME lending? Saurabh Jhalaria: Financing still remains the biggest challenge to the growth of SMEs in India. SME is not an attractive sector for traditional financial institutions like banks due to lack of sufficient information to assess credit worthiness in this sector. NBFCs are converting this challenge into an opportunity using technology to make the entire borrowing process hassle free. NBFCs have been able to focus on cash flow-backed lending while also considering the future outlook. Banks, on the other hand, have traditionally relied on collateral-backed lending and historical statements. Therefore, NBFCs are better poised to play a key role in filling the huge gap in credit supply to this segment. How you rate Indian SMEs in terms of their preparedness for institutional loans? Saurabh Jhalaria: Although SMEs are well prepared, a majority of them still do not have the resources or bandwidth to prepare for institutional loans. Most of the SMEs are unable to approach institutions due to lack of information required for credit assessment and apprehension about the transparency in the process. The recent shift to digital payments and the push from the demonetisation move has started a new wave of digitisation amongst SMEs. This will lead to build up of more digital data about SMEs which will enable NBFCs and other financial institutions to serve them better. Please share with our readers about InCred's future plans. Saurabh Jhalaria: InCred's ultimate aspiration is to be an inseparable part of every Indian family's journey towards financial success. We are building a diversified financial services group with a wide portfolio of products offering a superior customer experience to meet the needs of aspiring Consumers and SMEs in India, We want to establish InCred as a top notch brand in the financial services industry and are rapidly expanding our footprint across the country leveraging physical and digital mediums as we target a loan book of INR 4000 crore by March 2019.